A handful of new records were set this year in the U.S. mid-term elections. Record voter turnout and record campaign financing. In my October 2018 edition of my Katusa’s Resource Opportunities newsletter, I outlined to subscribers that I believed this year’s midterm election would see some of the highest voter turnout ever for a midterm election. Over 114 million votes were cast in 2018. In comparison, the 2014 election saw 83 million votes cast. One insane number to note: Political parties spent $5.2 billion on this year’s midterm election. For fun, let’s compare to the campaign spending here in friendly Canada. During the last federal election in 2015, total spending was only CAD$130 million. It’s unbelievable how much money is thrown into U.S. politics. Democrats outspent the Republicans yet again, by spending $2.5 billion. Republicans spent $2.2 billion. The total 3rd party spending came in at $480 million. What are the economic impacts from the mid-term elections? With a Democratic controlled house and a Republican controlled Senate, there is sure to be more gridlock on the legislative front. What both parties both agree on is that government spending on infrastructure will do more to stimulate the economy than further tax cuts. If both sides can come to an agreement, a significant fiscal plan for infrastructure could provide a tailwind to the U.S. markets. But with such an infrastructure bill will probably come a higher minimum wage hike. I think big funds are anticipating this and you could see a continued melt-up in the major U.S. indices for the rest of the year. 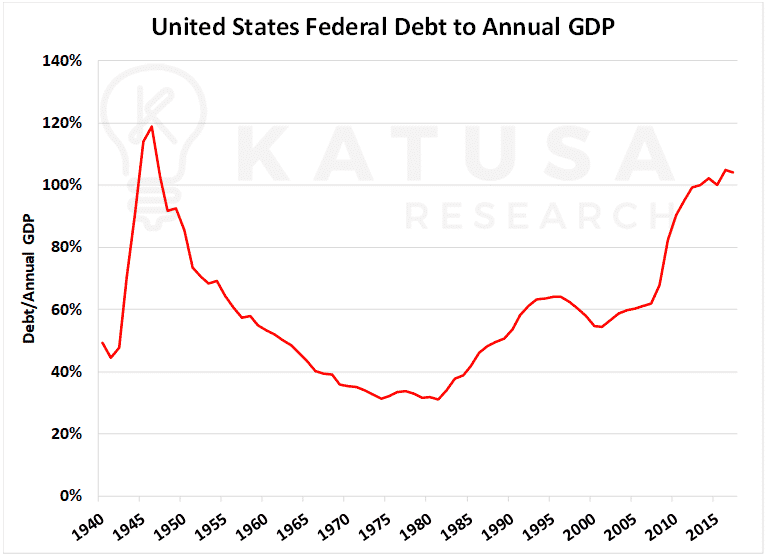 Looking further out, it’s important to note that the U.S. debt to GDP ratio is approaching all time highs. This is a scary number. If a country is overspending in good times like we have today, then what is the U.S. debt level going to balloon to if there is a long-term market correction or recession with higher interest rates? Below is a chart which shows U.S. the debt to GDP ratio. The higher the number, the higher the amount of debt there is relative to GDP. What Happens to the U.S. Dollar After Mid-Term Elections? The initial kneejerk reaction post mid-term election is a weakening of the U.S. dollar relative to other major currencies. However, I believe this is likely just a data point in a long-term term trend of a stronger U.S. dollar. The U.S. Federal Reserve is going to continue to raise interest rates through 2019, which is bullish USD. Additionally, U.S. federal trade policies will continue to remain protectionist. Again this is bullish for the U.S. dollar. Below is a chart which shows the performance for the USD against a basket of currencies. I have also outlined the U.S. dollar breakout and its new uptrend. What Happens to Commodities After the Mid-Term Elections? 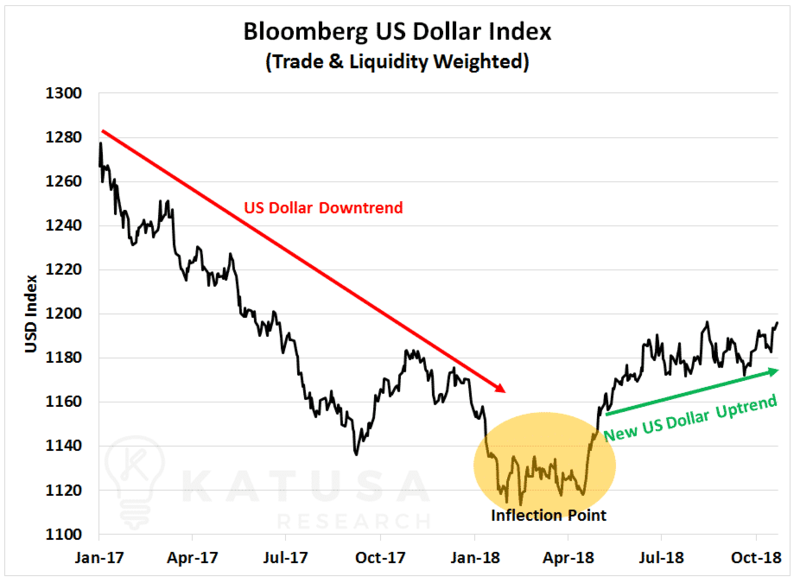 A strong U.S. dollar does not bode well in the short term for precious metals. Gold is priced in U.S. dollars, which means when the USD appreciates in value, gold will act in the opposite manner. Of course, in times of crisis you can get both moving in the same direction, though I do not see today as one of those moments. In the long term though, I see gold heading higher. At some point the chickens will come home to roost and the combination of rising interest and record U.S. debt will capitulate. The resulting economic situation will not be pretty but will be positive for gold and gold producers. For copper and the rest of the base metals, I don’t see much change from the mid-term election results. Protectionist policies in the U.S. will remain the norm for the next 2 years. This will cloud the short-term investment thesis for base metals. I suspect we are going to be in for a volatile end of the year. I outlined my investment thesis for the remainder of the year in my latest edition of Katusa Resource Opportunities, , complete with my top tax loss candidate ideas. I am excited about the potential fire sales on the horizon and I am loaded with more cash than ever before to take advantage of every opportunity.